An image of a single vivid coloured autumn read and yellow leaf on wet pebbles in a garden in Kaikozan Hase-dera Temple in Kamakura, Japan. Autumn in Japan is a truly spectacular sight. The viewing of autumn leaves has been a popular activity in Japan for centuries and today draws large numbers of travellers to famous colourful leaves (kayo) viewing spots both in the mountains and in the cities. This image belongs to the travel and nature stock photo library. This stock photo of Red-Yellow Autumn Leaf on Wet Pebbles is available for licensing for commercial and editorial uses including websites, blogs, books, magazines, brochures and advertising. Restrictions may apply for images which contain third party copyrighted material or sensitive subjects. Photos of artwork are for editorial use only. 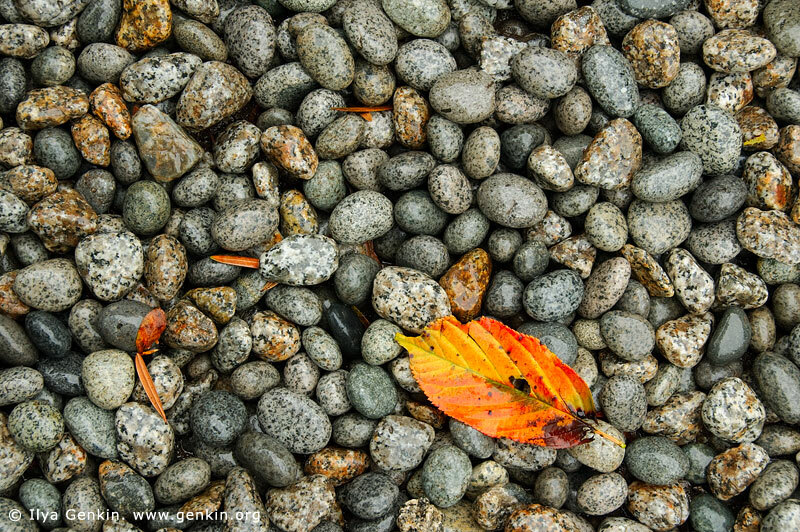 This image id INTIMATE-LANDSCAPE-0004 of Red-Yellow Autumn Leaf on Wet Pebbles, is copyrighted © by Ilya Genkin. This is not a public domain image.